Spandrel Glass is an opaque glass (not vision glass) used to conceal structural building components such as columns, floors, HVAC systems, electrical wires, plumbing, etc. Spandrel glass is often located between vision glasses on each floor of a building. Using a silicone paint, or ceramic enamel frit as an opacifier, spandrel glass can achieve nearly any colour, whether it be complementary or in contrast to the building façade. In order to reduce the probability of glass breakage due to thermal stress, spandrel glass should be heat treated. Spandrel panels can be used monolithically, in an IG, or in conjunction with laminated glass. Often a project may require spandrel glass to complement with vision glass used on the building, however, achieving an exact spandrel match can be difficult. Daylight conditions can have a dramatic effect on perception of vision glass to spandrel glass appearance. For example, a clear bright sunny day produces highly reflective viewing conditions and may provide a good vision to spandrel glass match. A gray cloudy day may allow for more visual transmission from the exterior and produce more contrast between the vision and spandrel glass. It is strongly recommended that a full size mock-up be viewed early in the design process to determine the acceptability of the vision and spandrel glass aesthetics. It is also recommended to view this mock-up under a variety of lighting conditions (cloudy, sunny, day, night). 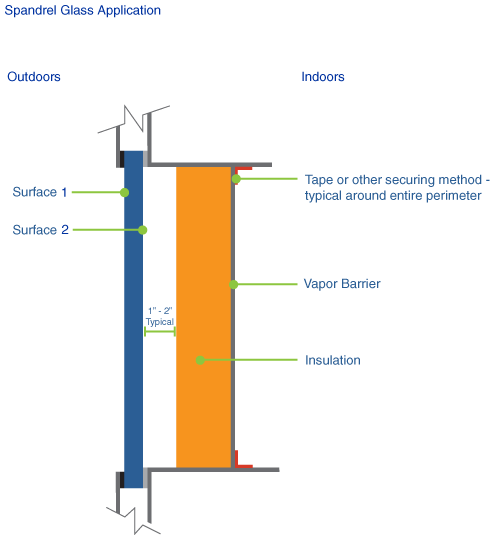 Insulating Glass Unit Spandrels are comprised of an insulated glass unit with an opacifier applied to with an opacifier applied to either the #3 or #4 surface of the indoor glass lite. To ensure a consistent overall aesthetic, it is recommended you use the same low-e coating on your vision glass and you insulated spandrel units. 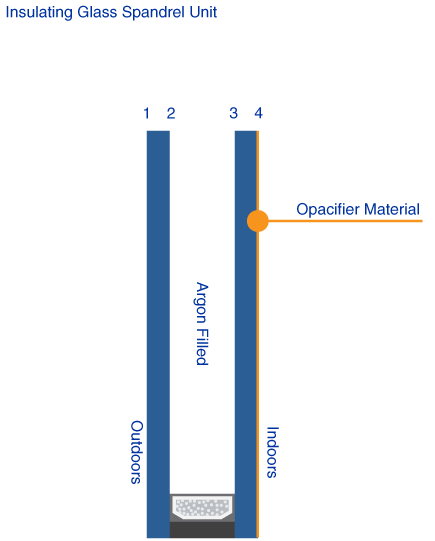 When used in conjunction with a low-e coating, the prime location for the opacifier would be surface #4. If a low-e coating is placed on the #2 surface and an opacifier on surface #3, compatibility of the opacifier and sealant, as well as the potential release of volatiles into the air space must be verified with Vitrum Glass group. It is important to note, the use of low-e coated glass in conjunction with a medium to dark pacifier will increase the temperature of the unit, resulting in elevated levels of thermal stress. Insulation is often used within an IGU and can be applied either directly to the glass, or positioned 1-2 inches from the glass surface. This added insulation can add to increased temperature to the glass and surrounding components, increasing the risk of thermal stress breakage, and impacting the durability of the unit. Shadow Box Spandrels is achieved by enclosing the space bounded by the vertical and horizontal mulions behind the glass. This is accomplished by securing a painted metal pan or dark matte-finished insulation board back from the glass. Typically, the inner face of the pan or insulation is flush with the inner plane of the vertical mullions. Shadow box detailing must also ensure that surfaces of the glazing system and surrounding materials have a dark surface to prevent read-through under some lighting conditions. Monolitic Spandrel involves a lite of coated or uncoated glass with an opacifier on surface #2. 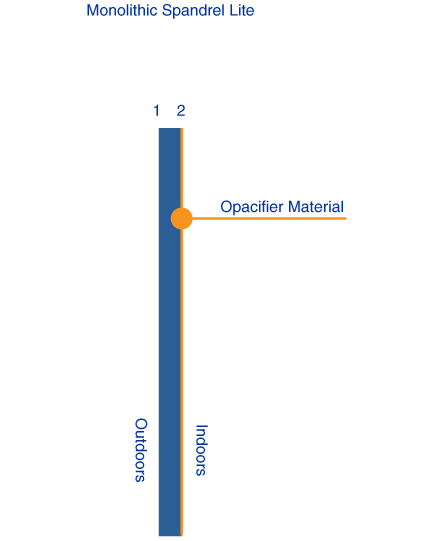 Insulation can be utilized by directly applying it to the opacifier layer.